Ask yourself each morning: what can I do today that will make my wife happy? For the most part, I’m thinking about items around the house that need to be handled (the proverbial “Honey, do…” list), though it can be other things as well. (When was the last time you bought your wife flowers? I buy my wife flowers every 10-14 days, usually at Costco, where it’s only $15 for a gorgeous mixed bouquet. Been doing that for many, many years. She loves it every time.) It doesn’t have to be anything major or showy, or even anything that she will notice that same day, just something that will bring a smile to her face (or even just a sign of relief). My wife will be gratified to know — far too late, since our kids are (mostly) gone — that she was right about the need for them to keep their rooms smelling fresh. ..bruce..
Yeah, I should have written and posted this yesterday, but I didn’t realize it was the 20th anniversary until today (thanks to this post). Sandra and I, with seven of our nine kids, had moved to Soquel, California in early 1988. Actually, we were five miles outside of Soquel; we bought a home in the Santa Cruz Mountains, a long ranch-style house on five acres of land covered with redwood trees. Then we hit the Tech Crash of 1988-89 and worked hard to keep things going, while I was continuing to do contract work at Apple and Sun, as well as writing both articles (mostly Macworld) and books (The NeXT Book, Addison-Wesley, 1989). At 5:04 pm on October 17, 1989, I had just gotten home about an hour or so earlier from a drive up to San Francisco, most likely to the Macworld offices. I was in my home office, using my NeXT cube and a modem to be on-line on BIX (BYTE Information eXchange). Sandra and most of the kids were home, though Jacqui and Heather (both 13) were over at a friend’s house some miles away making poodle skirts for a school ‘sock hop’. 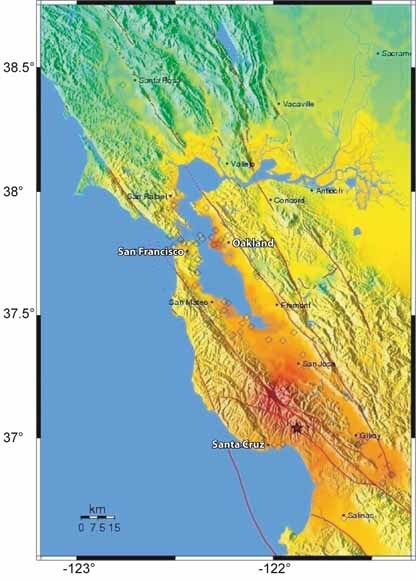 The quake started, that in itself not a big surprise; I was a Californian, and we’d lived here in the Bay Area for nearly 2 years, so we were all quite used to minor shakers. But then it got very strong, very fast. I jumped up and braced myself in the doorway that led from my office to the master bedroom. The shaking was very hard and very long, and all I could think about were the very tall redwood trees all around the house, any one of which could fall over and slice the house into two parts. The quake finally died down, and I went out through the office’s sliding glass door to the outside deck and saw a glorious, once-in-several-lifetimes sight: dozens of giant redwood trees all swaying in unison in big sweeping arcs, while millions of tiny golden redwood leaves drifted down. None of the trees had fallen over, so I ran back into the house to check on everyone and to see what damage had been done to the house. The home phone rang almost immediately. It was Sandra’s mother, Nora, calling from Orem, Utah. Sandra’s dad, Andy, had been watching the World Series game, and when the earthquake struck, Nora immediately called us to see if we were OK. It was the last incoming phone call we’d get for several days, as attempts by most of the rest of the country to call into the Bay Area would jam up the incoming phone lines. Sandra assured her mom that we were all OK, and then we set about taking inventory. The kids, while a bit terrified, were all unhurt, so we did a quick assessment on the house itself. The house actually came through the quake very well. There were a few small cracks in one wall, and a few bookshelves had fallen over, but that was about it. We quickly started filling up sinks and tubs with water; we were on a well and had a holding tank (gravity feed), but we didn’t want to take chances. A smart move, as it turned out — the quake cracked the line from the well to the holding tank. Power was out, so the well was no longer pumping water up to the tank; instead, the tank emptied itself through that cracked line over the next several hours. By now, the aftershocks had started. Since (as it turned out) we were only 3-4 miles from the epicenter of the quake, we felt all the aftershocks — and there would be literally dozens of them (“Fifty-one aftershocks of magnitude 3.0 and larger occurred during the first day after the main shock, and 16 occurred during the second day. After 3 weeks, 87 magnitude 3.0 and larger aftershocks had occurred.”) We felt all those aftershocks and many smaller ones as well. As mentioned, we had two daughters over visiting friends several miles away. I got into the minivan and drove off to get them. The effects of the quake were quite visible; there were actual landslides in several places, and obvious structural damage to both houses and buildings. When I got to the house where Jacqui and Heather were supposed to be, it turned out that the family there had already left with them (and the other girls who were there) to drive them all home. If I recall correctly — it has been 20 years after all — I stopped at one small hardware store on the way home. The large front window of the store was completely smashed out, and the owner was selling stuff (batteries, mostly) directly through the window. I bought some batteries and headed home. Our house ran entirely on electricity (which was gone and would be for about 24 hours), so I fired up the BBQ grill out back to cook dinner. Afterwards, we gathered all the kids in the living room with sleeping bags and pillows, built a fire in the fireplace, and spent the night there. By now, some of the radio stations were back on the air, so Sandra and I used the battery-powered radio, with each using one earpiece of a standard pair. 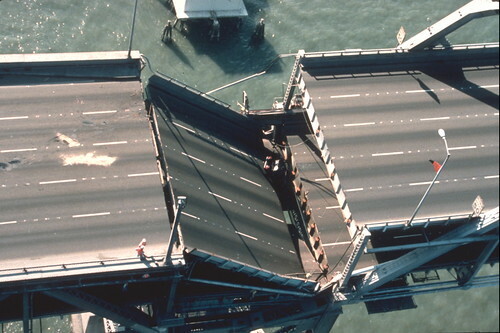 We spent most of the night listening to live reports of the devastation around the Bay Area, including the fires in the Marina district, the damage to the Bay Bridge, and the collapse on the Nimitz Freeway, all while aftershocks were hitting every few minutes. It truly felt apocalyptic. It was an afternoon that I did not have much homework, and I took advantage because I was tired from early morning seminary. I woke to the violent shaking and watching the windows in my bedroom dance back and forth, as they bounced up and down with the tremors. I quickly got into the doorway and waited for what honestly seemed like an eternity until the calm finally set in. Rushing to the kitchen, mom was there heading out the back sliding door onto the deck. The fear from the earthquake was only the first of many fears that crossed my path. The next was being outside, watching the giant redwood trees swaying in unison with the only sounds made were from the falling debris, and creaking sounds from the trees themselves. There were always birds making ruckous and just other sounds of nature, but at that moment, the trees were the lords of the dance. At that moment, one of the many aftershocks hit and I just remember feeling as if I was strapped into a horrible carnival ride that I was not able to see what might be coming around the next turn. Over the next few hours, there were many assessments made of the interior and exterior of the home. For me, the sight of cracked walls and topled bookshelves was beyond what I could grasp. I knew we were in earthquake country, but no one ever explained the feeling of standing in a doorway as the house groaned all around you. Or, the many aftershocks that made sleeping close to an impossiblity. As we all gathered in the living room in sleeping bags and flashlights, there was a little bit of chatter, but no topics could outdo the tenseness we all felt. Unexpectedly, another tremor would hit, some were huge and felt like the original, some were just enough to break your calm all over again. What is funny is that all these years later, I still remember that the high school was supposed to have a day off on Wednesday, and I was so excited to go to seminary in my pijamas. To say the least, we did not have seminary the next morning, and we had several days off from school as repairs needed to be made on classrooms and even the swimming pool on campus. There are moments, even 20 years later that I cringe or my heart skips a beat when I feel the floor shake from someone walking across or sitting on an overpass when a large truck passes. Right after the earthquake had hit and we were all gathering outside on the deck, when you came out and Mom (I think it was mom) freaked out because a bottle of ketchup had spilled on your birkenstocked foot and she thought you’d been injured. Wes, Jon and I sleeping outside your bedroom door (after you callously told us we could no longer sleep in your bedroom). I remember being woken up by Mom tearing open the door after an aftershock that I had apparently slept through. Wes refusing to leave the couch against the wall because of the aftershocks. One night the entire family was sitting at the dinner table, trying to persuade him to finally leave the couch, and just as he gets up, another shock hits and he dives back onto the couch. Wow, I can’t believe it’s been 20 years! I remember being at the friend’s house (I can’t remember their names, unfortunately) and I believe we were cutting the fabric out for the skirts when the house started shaking. At first I thought that someone was jumping up and down upstairs until I remembered that they didn’t have a second floor. Once we realized what was happening, we all ran to the door that lead to the garage. It seemed like 5 or so of us tried to fit in the door frame together. We could hear stuff falling out of the kitchen cupboards and breaking. It seemed to go on forever. Once the main quake was over, I remember we all went outside. Most of the houses were actually okay, except for the chimneys. Once we got home, I remember all of us staying in the living room together. I didn’t realize how many aftershocks there would be, and how strong many of them would be. I have other random little bits I remember too, mostly visual: the concrete stage broken and partially fallen (I believe it was on the beach at the boardwalk), tree debris (leaves, pinecones, small branches) all over the driveway and road by our house, and some pub in Soquel that had a chimney covering part of one wall that had completely fallen down (we drove by it all the time). And of course, how very easy it was to scare Mom. Even well into our time in San Diego, you’d start shaking the window behind Mom and she’d start to freak out and get mad at you. I’m sure it still works to this day. I am profoundly struck by the wisdom and courage of this woman in how she dealt with a painful and risky situation. I think there’s a lot here for LDS couples who have hit a rocky spot in their marriages. Read the whole thing. ..bruce..
Latter-day Saints tend be very familiar with the “Christus” statue by Bertel Thorvaldsen, because replicas of the statue are found at several LDS temple visitor centers (most notably Salt Lake [see above] and Washington DC) and photos of the statue itself are commonly used in LDS materials. While my first impulse is to wince, I think that children would be utterly fascinated by this statue, and that it might give them an entirely different perspective on their own roles as artists and creators with the materials they typically play with. ..bruce..